There are a lot of factors that interfere with objective reception of Lana Del Ray’s (officially Elizabeth Grant) debut album Born To Die; and all of them do not paint her white. Even before the official release of the CD, the Internet was flooded with comments about what Grant really is and what she may count in the not-so-easy music business. With her image of Gangster Nancy Sinatra, the young singer has recently issued a single called Video Games to divide the audience in two segments, those who admired the song as well the performer, and those who got to mercilessly criticize her. The latter stated it vigorously that as a daughter of a millionaire, she would not be able to convince the public with her part of a cynic personal with tarnished background, rude manners and a language close to prison speech. The same folks keep reminding us constantly that Lana Del Ray is not a talented girl from an ordinary family who blazed her path to glory with impressive artistic achievements, but a pampered lady who only needs to know how much there is to pay. Finally there were a lot of doubts if Born To Die will have one more song to be on par with the objectively fine Video Games. Born To Die really is not a very smooth album where there obviously brighter tracks that alternate with less prolific material. Yet one but has to take note of the verve and pompousness of the work, its powerful and rich arrangements, all aimed to charge the maximum drama to this performance. Truth be told, Born To Die has only one serious drawback and that is the lyrics. While those who do not understand English by ear do not find it a problem, the rest of the audience will need to shift their focus to the music and Del Ray’s manner of singing. The singer was wise enough to realize high register was not quite her style, and began polishing lower register singing. Her voice houses with equal comfort coldness and remoteness on the one hand and sadness and insightfulness on the other. Backed up by orchestral arrangements, the slower songs leaning to ballad material sound almost like soundtracks to thrillers. 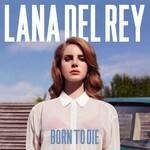 A great example is not hard to find – try the album opener, Born To Die. Lana is twenty five now, but she strives to try roles of most various people from most various social groups who are united by some sort of despair or disappointment with life. Born To Die kicks off very impressively and, probably, too mightily. Video Games, and Blue Jeans capture you with the richness of instrumentation, and the following tunes try to keep up with it. However, in cases like that there comes a moment when you want to switch to something simpler, to something more acoustic, and you do not have anything of that kind here. It is apparent that Lana Del Ray with all her efforts (and all the track list) wants to prove that she has a dozen and half songs like these two. Besides, heart-breaking ballads do not correspond to her style. The bluesy Million Dollar Man does not count because, strictly speaking, it has no hooks to get at you. But the rest of the record is a collection of hits and semi-hits with luxurious sound, some faster, some slower, borrowing its beats from RnB, and only catchiness of melodies makes them different. One would definitely remember National Anthem with a couple of acute and accurate lines about the contemporary society, and This Is What Makes Us Girls, where the singer managed to conduct an authentic an sincere grief, leaving the image of a sophisticated cynic lady. As a short conclusion, Del Ray’s debut album is a sheer success. It is not long before loud cries about this singer’s doubtful future are replaced with warm reviews for this stunning work.